Globalization continues to change our world. How do our perspectives shift and evolve as communities continue to diversify? Make a visit to Engagement and encourage students to freely explore and interact with the art pieces individually and in groups. This Art Inquiry process enables the students to practice observing, describing, interpreting, and sharing visual information and personal experiences. Use the Art Inquiry Worksheet (PDF) ide and capture their ideas and impressions. Customize or create your own Art Inquiry Worksheet as appropriate for your project and class needs. Have the students discuss the many aspects of relationships that this sculpture portrays. Students may wish to discuss the changing roles of engagement and marriage, the placement of the installation in the heart of the LGBT community, the decreasing influence of religion in relationships and the increasing role of state. BIG IDEAS Anywhere educators: View the Engagement Guided Tour Video MUTE ON and encourage students to explore at different angles individually and in groups. • View Guided Tour Video: View the Engagement Guided Tour Video again with SOUND ON. • Artist Themes – Perspectives: Projecting the images of Engagement, have students begin exploration of changing perspectives by looking at the artwork from different angles, during different time of the day. Ask students to reflect on the different impression to the viewers. 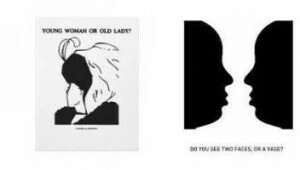 Show two images of optical illusions: reflect on the idea that depending on our viewpoint or perception, how our view can change. Complete the sentence “—- is most important to me,” keep it anonymous and post around the classroom for a gallery walk. Facilitate comment on each other’s posts. Have students explore a broad topic of family/relationships/personal goals/business/education… in a changing world. Collect and list cultural opinions/stereotypes or roles of men/women and contrast these stereotypes with their own perspectives and family background. Findings can be represented visually in a collage/model/written/performance etc. Media exploration: Have students examine a newspaper, news site or popular entertainment program to compare the portrayal of cultural stereotypes or roles of men and women with their finding in the first part of the challenge or sample newspaper articles from 100 years ago. What does a 21st century family/education/business/ideal/future look like? In small groups, have students create an advertisement as it may be presented in our media today in modern society. Have students host a poetry café night where they will invite friends and family to come and hear poetry on what it means to be a man or woman in today’s society. Students can read their original work, or introduce and read the work of a prominent author whose work deals with issues of gender and society. • English – Oral Language: Explain to the students the styles and techniques of Point of View (with the use of video clips to provide examples; a film version of The Diary of Anne Frank would be a good example of First Person POV) and its importance in literature. Students will then be asked to pick one form of point of view and compose a short story. Students could also be asked to create a short story expressing an event from two or more points of view. • Science: In groups, the students choose a current research topic of interest (e.g. green energy, network, medical research) and look into the scientific progress for the past 20 years. Present in class and discuss the impact of ever-changing scientific findings on the lives of people in different countries (how it changes the perspective of how one views the world).